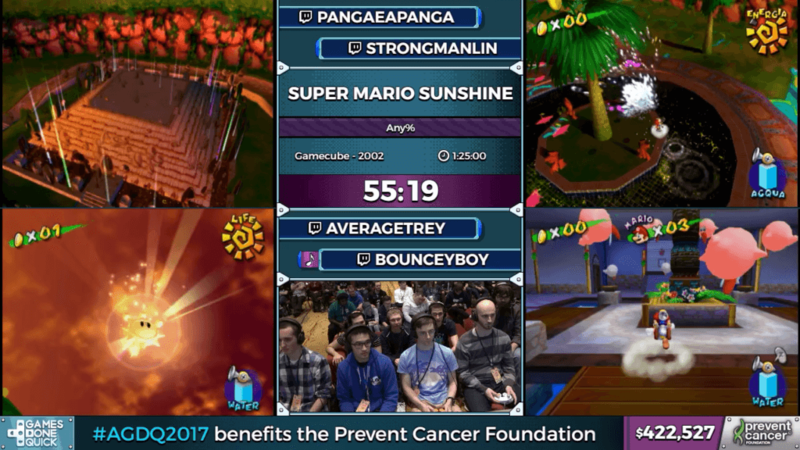 We’re pulling up on the halfway point for AGDQ 2017, and it’s time for more Mario and more races! One of my favorite games as a child, Super Mario Sunshine, is a great game to speed run. There’s a variety of tricks, namely movement techniques, that make it visually amazing. As our runners pop on their FLUDD devices, let’s hope for a high speed, high pressure run! If you’ve never played Super Mario Sunshine, I highly recommend checking it out! Once again, the runners are running the Japanese version. This is simply for text speed. Since this is an “any%” run, the runners simply need to beat the seventh shine (objective) in each world. If you’re unfamiliar, Shines in Super Mario Sunshine are the equivalent of Stars in Super Mario 64. Some tricks are going to allow them to skip Shines and go directly to the seventh (which isn’t intended). The runners will be using a variety of movement tech, including a few that I’ll break down. “Spam spray” is achieved by spamming the R and A buttons, which produces a huge jet of water. This is excellent for clearing large amounts of sludge and causing damage. “Water Slides” are exactly what they sound like. Any time there is water on the ground, Mario can slide on it and reach maximum speed quickly. The combination of these movements with some smart momentum conservation will be the main catalyst for a quick run. With the main cut scenes and tutorials done, the runners are all neck and neck. Utilizing a new trick, BounceyBoy and StrongManLin get a quick kill on the first Shadow Mario. This is done by spam spraying out of a roll, and is super precise. Upon entering Bianco Hill, the first level, the runners skip the first Shine objective and go straight to the Petey Piranha fight (the second Shine objective). After that, it’s onto the first secret level. In these levels, Mario doesn’t have the FLUDD device, which limits his movement ability. These are high stress points, but are super fun levels to play casually. 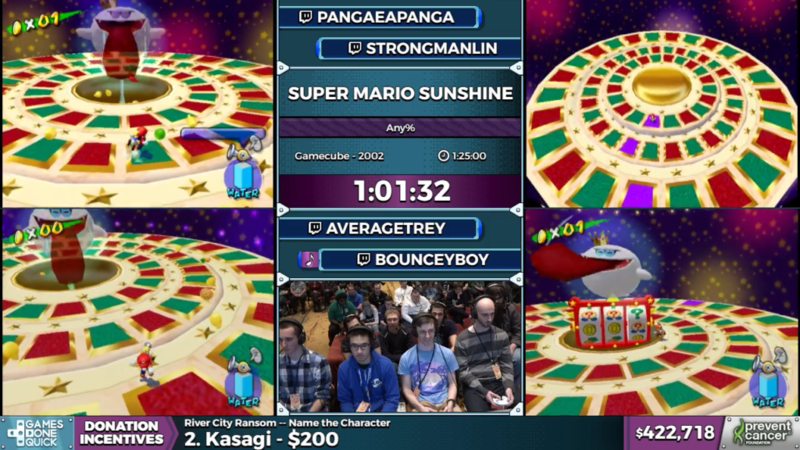 On the next Shine in Bianco, AverageTrey takes a hit and loses some significant time. 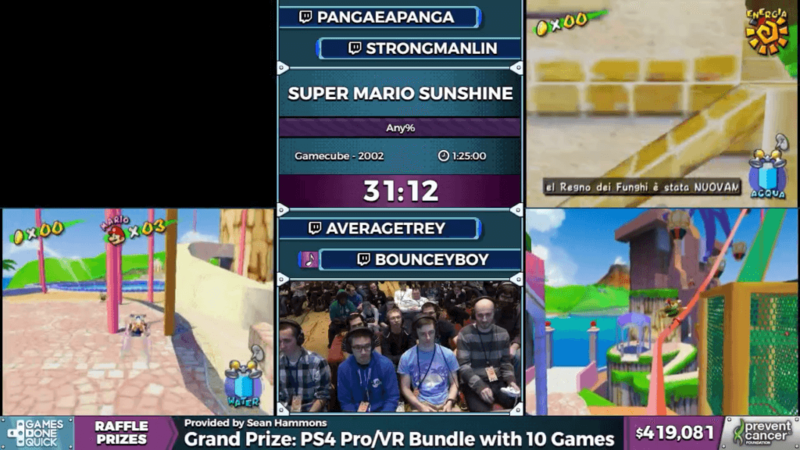 After fighting Petey Piranha for the second time in Bianco, BounceBoy takes a small lead. With that, it’s onto the next world, Gelato Beach. It features the biggest skip in the game, which allows you to get the last Shine in the world. This opens up the seventh shine, which is needed for completion. By grabbing a coconut and sliding at it at the right time, it allows you to clip through the hut that holds the final world shine. All runners get this super difficult trick on their first try; we got a race on our hands. Pangaea pulls off the trick in the top left screen. After a quick kill on the seventh Shine Shadow Mario, they move onto the next world, Pianta Village. This is one of my personal least favorite worlds, so watching these runners execute perfect skips feels really good to see. It’s a village full of lava traps, chain chomps, and dangerous jumps. One of the best tricks showed off in this world completely skips getting Yoshi. By colliding with a nearby tree, the runners are able to clip into the mushroom and grab the Shine. Normally, you’d need Yoshi to clear up some slime, but this avoids having to get him at all. 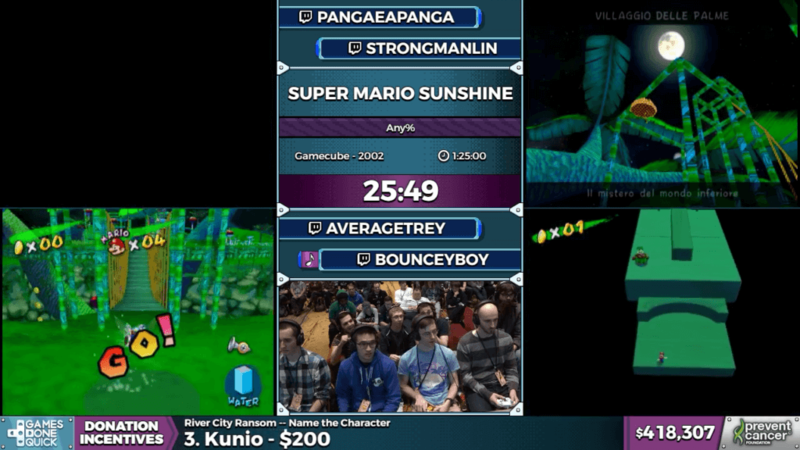 On Pianta Village Shine 5, BounceyBoy misses a trick and loses his lead to PangaeaPanga. That being said, all the runners are neck and neck, with leads only equating to a few seconds advantage. Pangaea keeps this lead going into Pinna Park, the third world. By clipping through a nearby building and dying at the same time, the runners are all able to skip a lengthy cut scene at the beginning of Pinna Park. Strong pulls off the trick in the top right screen. Pinna Park is one of my favorites. It’s a huge carnival with some super fun objectives. The first shine has Mario riding on a roller coaster, shooting missiles at a giant mechanical Bowser. 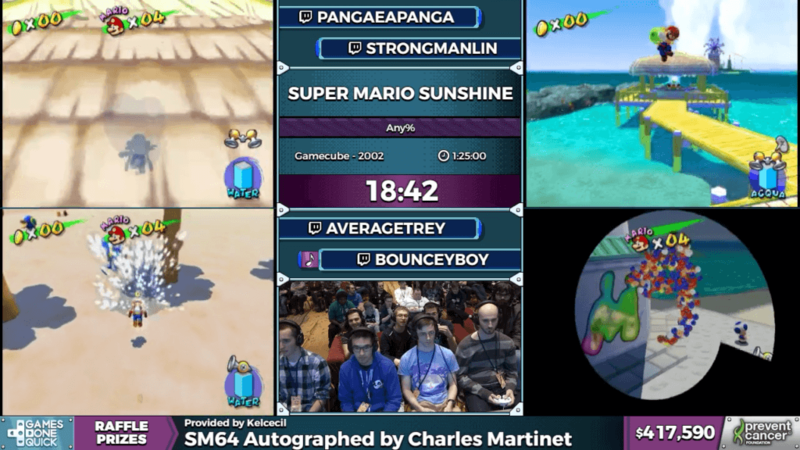 While there isn’t a lot of hugely stressful Shines that come up, the third Shine objective almost causes PangaeaPanga to lose his lead, but with a super clutch save, maintains it. Pinna Park is also where they unlock Yoshi, which allows a pretty interesting skip. By utilizing the purple platforms Yoshi can make appear, the runners are able to skip past a gate, which allows them to access the park when they’re not supposed to. This allows them to get to the sixth Shine immediately, skipping the fifth Shine entirely. After defeating Shadow Mario once again, they move onto Ricco Harbor. AverageTrey pulls off the Yoshi trick in the bottom left screen. Ricco Harbor will be familiar to those who have played Sunshine before, featuring a giant Blooper fight. 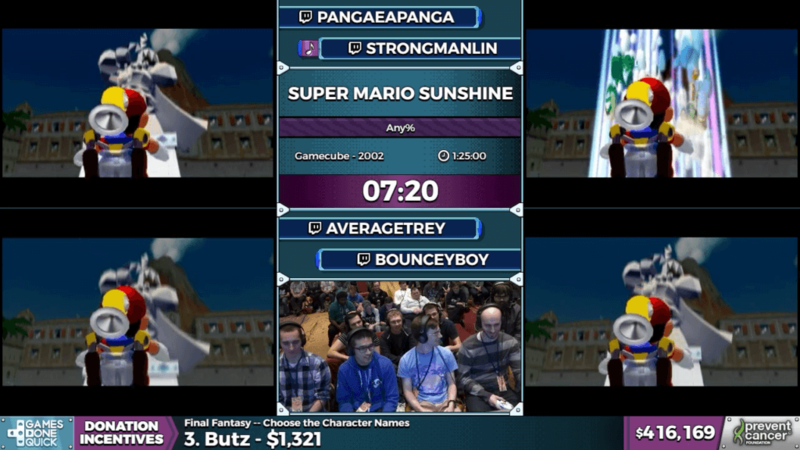 The fight doesn’t feature any crazy tricks, but it’s the catalyst to lead BounceBoy right up to Pangaea’s lead. 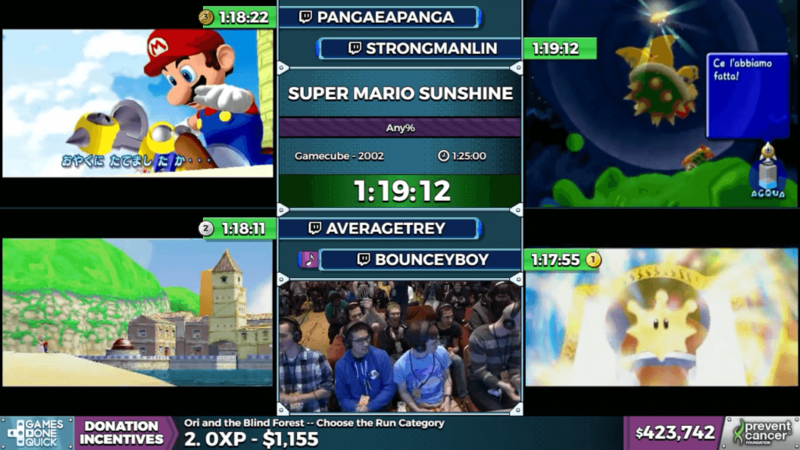 Quickly thereafter, BounceyBoy regains his original lead by finishing the blooper race a singular second ahead of him. He holds this lead throughout Ricco Harbor, as the runners fight another Blooper Boss, and decimate another secret level. 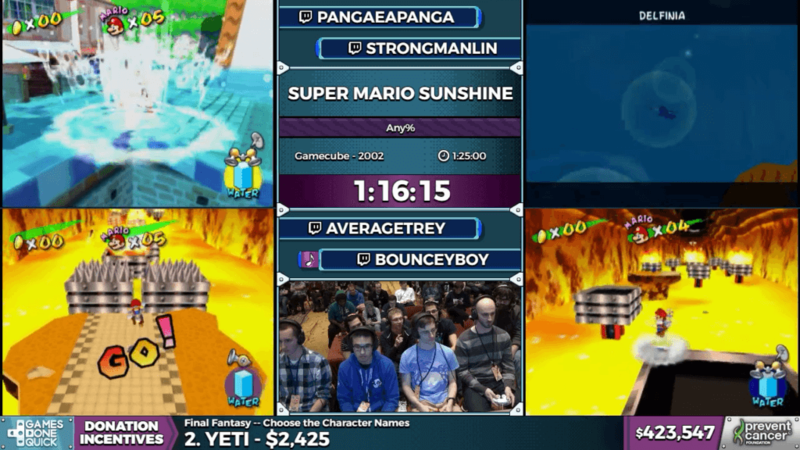 At this point, BounceyBoy heads back to the first world (Bianco Hills) to finish it up. In the sixth Shine objective of Bianco, BounceyBoy pulls off some insanely risky movement tricks. 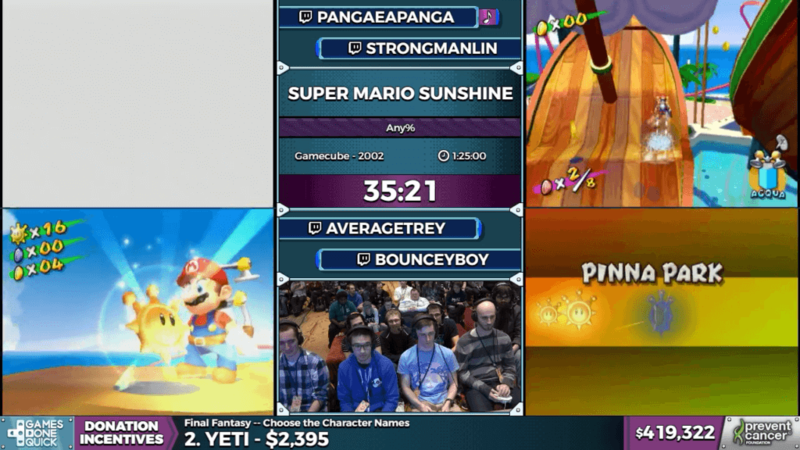 This allows him to pull further ahead of PangaeaPanga and AverageTrey. With that done, the runners head to grab Yoshi to head towards Sirena Beach. If you’ve played Sunshine, you’re well aware of Sirena Beach. It starts with a cleanup of the beach, as you fight off a giant ghostly manta ray. If there’s anywhere for a lead switch, it’s probably going to be in Sirena. AverageTrey overtakes Pangaea for second place, with BounceyBoy still maintaining his lead. Shine 3 in Sirena is especially annoying during casual play, but the runners easily grab the Shine before intended by clipping through the glass wall containing it. Sirena Beach also contains the King Boo fight, which contains some unfortunate RNG. 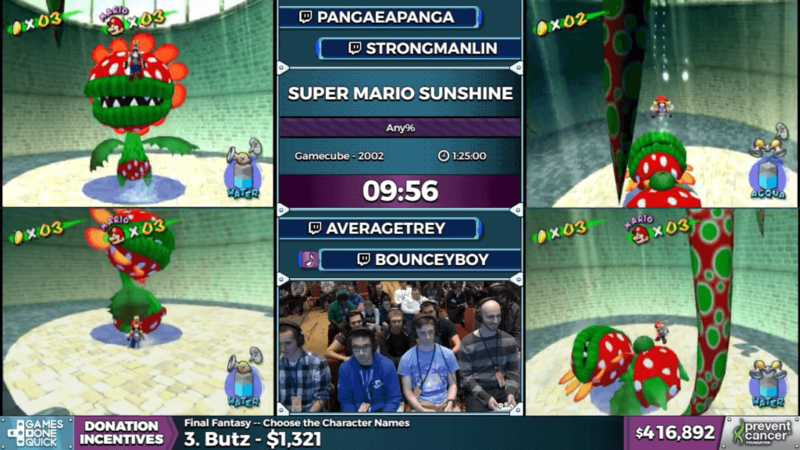 BounceBoy falls prey to this randomization, losing some valuable seconds. This tightens the gap between himself and AverageTrey, but he keeps his lead heading out of the boss fight. Shine 6 in Sirena also features a difference between the regional games. It’s another clean up Shine, where the player has to spray water to clean up the slime on the beach. The Japanese version requires the player to clean 100% of the slime, whereas the PAL and North American versions don’t. It’s an interesting change, but goes to show how much the version of the game matters during speed runs. After defeating Shadow Mario again, the runners move onto the final world, Noki Bay. It’s a pretty area, but one of my personal least favorites. It’s a very technical area for the runners, and is incredibly interesting to watch. The consistency of the runners’ skill is absolutely amazing. 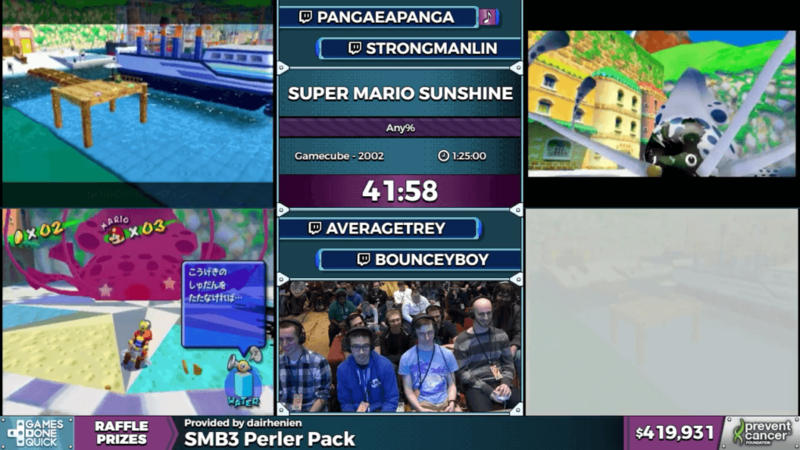 Super Mario Sunshine is a demanding run; Noki Bay is showing that off perfectly. All the runners dispatch the giant eel boss easily, making quick work of the normally stressful boss fight. 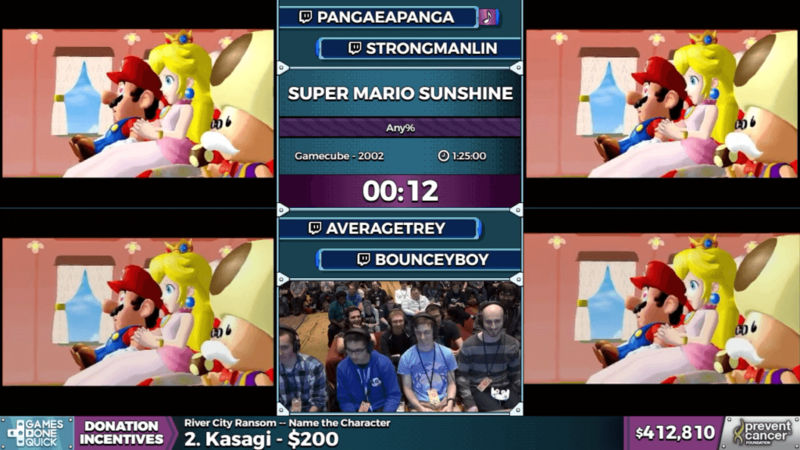 In Shine 6 of Noki Bay, BounceBoy messes up quite a few times, almost losing the lead to AverageTrey. At this point, all four runners are neck and neck. One false move can shift the lead to any of the runners. As they lead into Corona Mountain, the pressure is on. Showing off a new rocket glitch, the runners skip the entire cloud section that leads to the final boss. 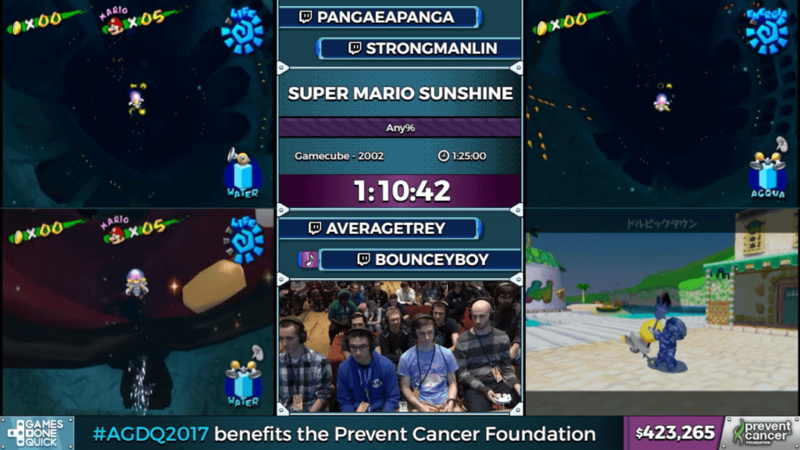 Trey and Bouncey are battling for that first place, but Bouncey is able to complete the final Bowser fight mere seconds before Trey. As all the runners clean up their final boss fight, we say goodbye to a great run. 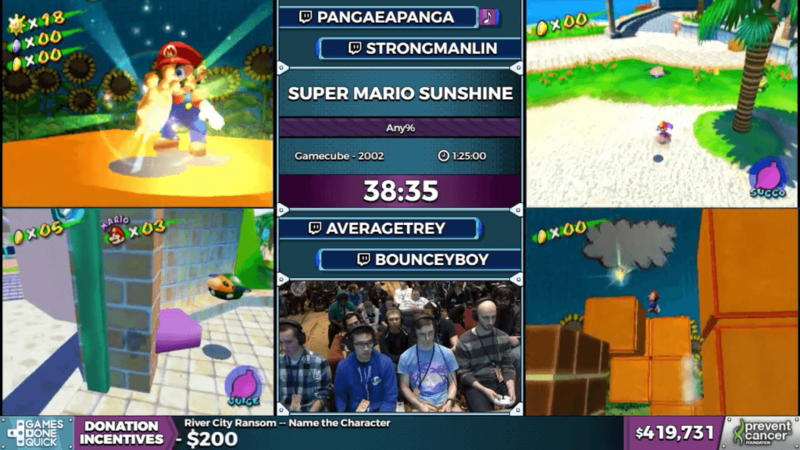 A solid feat of skill and consistency, Super Mario Sunshine turned out to be an intense race.